Two vastly different “films” come to Terror TWOsdays today. The first is a Blu-ray release from Garagehouse Pictures that compiles a bajillion TV spots from 70s horror and exploitation films. The second is a dark psychological drama about loss and pain with a few little tinges of horror that made the festival rounds and will officially release in August. Both are great watches, even if Josh didn’t love Show Yourself as much as I did. The fourth volume in the Trailer Trauma series is a marathon of madness featuring 268 of the best and rarest TV spots for some of the greatest and most obscure 70s theatrical horror and exploitation films and beyond. Over three hours of demented delirium that will leave you traumatized. 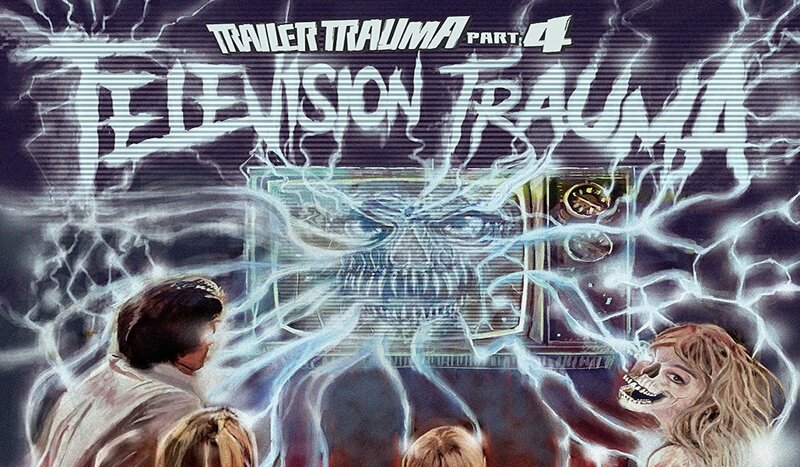 Trailer Trauma Part 4: Television Trauma is a tough thing to review as it’s a collection of television ads. But to call it “just a bunch of commercials” would be completely underselling it. It’s a collection of nearly 250 weird and bizarre TV spots, complete with an awesome commentary track. Authors Michael Gingold and Grady Hendrix, as well as Chris Poggiali from Temple of Schlock, chat about the spots, adding interesting tidbits and a good few laughs. Fans of exploitation and horror from the 70s should consider this a must own release. Crack open a beer and enjoy this bizarre smorgasbord of weirdness from those amazing cinephiles at Garagehouse Picture. Keep up the great work, Harry! I’m working on a full review of this one for Cinapse, another site I write for, however I felt compelled to plug it here too. While it’s clearly not for everyone (as noted by Josh’s lukewarm review linked above), I found this film extremely effective. However, I should start with a caveat. This film opened at the Bruce Campbell Horror Film Festival to mixed reviews. The reason for this, in my opinion, is that Show Yourself is not a horror film. The horror elements are there, but it is ultimately a psychological drama about a main dealing with the grief, pain, and trauma of losing a loved one. Even with a very broad definition of horror – as I certainly have – this is only horror adjacent, at best. Gorehounds and horror nerds need not apply, as this one isn’t likely for them. However, if you are a genre fan with a penchant for genre bending and something different, this one is a treat. Great work by director Billy Ray Brewton on his directorial debut with this beautifully shot and well made film. Even the naysayers all seem to agree that he has one hell of an eye for gorgeous cinematography and has a bright future ahead of him.